Read about how this project got started, and then visit the new Kids to Kids blog to follow what we're working on now! "Kids To Kids" is raising awareness about the need for sustainability on a worldwide level with young people from two very different cultures. 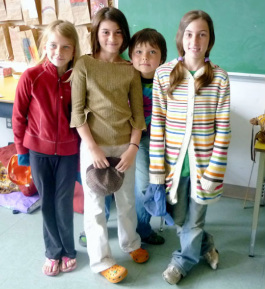 Started almost twabout three years ago by 4 Comox Valley children who were volunteering at a Fertile Ground fundraiser, the project provides opportunities for kids here in Canada to connect with kids from Assam, India. In 2010, Fertile Ground began working with families in a remote area of Assam, close to the India-Burma border. When "Kids to Kids" member Onyx Vaughan Ogilvie learned about some of the challenges facing children from this area, he knew he wanted to help out. Here at home, Onyx and his mother LeighAnn Vaughan decided to raise funds for school supplies and other necessities by organizing a fundraising dinner. In March 2011, at their own expense, they made a trip to Assam to meet with other Fertile Ground members and volunteers who'd been been on the ground for 2 months, visiting the new Singpho language school in Ketetong village and working on community gardens, latrines and playgrounds in the Sadiya area. Leighann and Onyx used proceeds from the dinner, as well as donations from restaurants Go Mango, Freakin' Coffee, the Zocalo Cafe and from individual donors, to purchase books, pens and pencils, sports equipment, water filters, metal storage boxes, desks and other useful supplies for the schools. Onyx and the village children worked side by side in Sadiya at the new demonstration garden recently established by NEADS, the North East Affected Area Development Society. Together, the kids created a marigold garden, played soccer, flew paper airplanes together, and helped install a swing set and teeter-totter too! During their stay in Assam, Onyx and LeighAnn also hooked up with fellow Fertile Ground board member and photographer, Sarah Kerr. Sarah had brought a number of digital cameras donated by friends and supporters in the Comox Valley. Her goal was to show young people how to use photographs to share stories and information about the environment and the culture of Assam with their counterparts in Canada. While they were in Jorhat, an Assamese NGO called Prakriti - Save Nature launched an exciting new initiative called Parivatan (Change Within Ourselves). 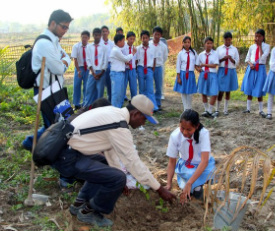 In partnership with Fertile Ground and "Kids to Kids," they hope to bring kids in Assam and kids in the Valley together as they work to support growing healthy food, protect the environment and encourage use of sustainable agricultural practices around the planet. To see more images of "Kids to Kids" at work, visit our new blog! 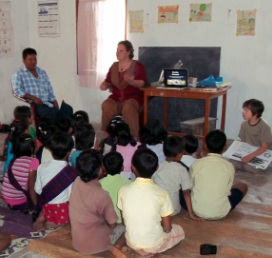 Kids here in Canada are learning about some of the neat things teachers and students are doing in Assam, too! If your class would like to get involved, be sure to let us know! _Students in Ms. Haryett's class at West-Mont School in Metchosin learned about how kids in Assam use earthworms to make compost that helps them grow healthy food in their gardens. Fertile Ground's volunteers will be returning to India early next year and while they're in Assam, they'll share stories, photos and pictures from kids here in Canada with students and their families!